When looking through the vast majority of options to watch your favorite movies or Netflix shows on, or even play the latest video game of Sea of Thieves, you can choose a television or projector. Both have their pros and cons for sure, but with the ever-changing technology, the projector is gaining steam every day with better image quality and functionality for those who want something larger than a 75 inch screen. If you're looking for a screen size of 100 inches to 300 inches, a projector is the way to go. As time passes, we see better projectors with better LED lights, bulbs, inputs, and quieter fans. When talking about this new Optoma IntelliGO S1, portable perfection are the two words that come to mind. There always comes a time when you want to go to a friend's house for a party of some sorts, a wedding, or even just put on a movie in your own backyard, but it seems like a hassle to bring a giant piece of equipment with you and set it all up. The Optoma IntelliGO S1 completely rectifies that situation as the unit is the size of your hand and weighs less than a pound. It also has the inputs you'd want as well to watch your favorite films and TV shows, along with wireless capability, streaming options, and audio speakers. As I dive into the details with this unit and it's relatively low price point, you'll easily see why this projector is a winner for those who want a small and portable projector that is easy to use and comes with everything they could possibly want. How does this Optoma IntelliGO S1 with DLP look when watching films and playing video games? Well, it looks amazing on every level, given the portable aspect and not being true 1080p or 4K. 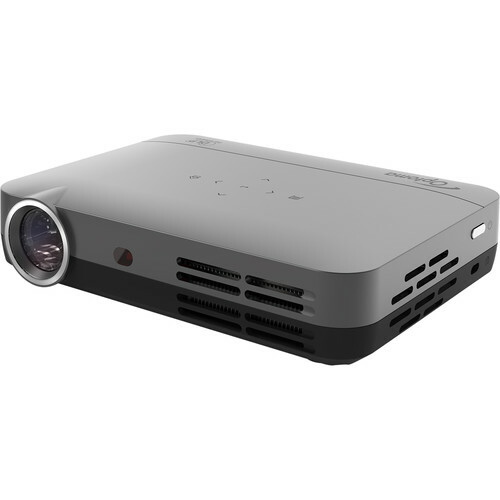 If you are wanting these aspects in other portable projectors, you'll have to pay quite a bit more than this unit. I popped in the new I Tonya Blu-ray and I was completely satisfied. The detail is sharp and vivid in each scene with a great layer of grain throughout. It gives the movie and story that filmic quality that adds a ton of depth into each moment and physical scene. This is something we don’t usually get with the highly glossy images. Facial features, such as pores, makeup blemishes, wrinkles, and individual hairs look incredible in all lighting conditions as well. The colors are well balanced and bold throughout, even if some of the scenes have a darker ambient lighting to it, like if it was made on a home video camera. It’s all part of the style of the film and it’s highly effective. The black levels are deep and inky and the skin tones are always natural. Blown up to 100 inches, the image never went soft or blurry whatsoever. I also put in Manhattan Murder Mystery on Blu-ray to see how an older film looked on the projector and, once again, I was satisfied. The image looks spectacular here, while keeping its excellent filmic quality. There is no digital sheen, which is nice. The depth of the cityscapes and skyscrapers of New York come to life as well. Colors are bold and striking in exterior shots of the streets of the Big Apple where all bright primary colors stand out. Inside the apartments, things have a warmer color tone with browns, reds, and greens. It’s very inviting for sure. Black levels are mostly deep and inky and the skin tones are very natural. The detail is sharp and vivid that showcases individual hairs and facial lines on the actor’s faces, while wider shots never go soft. The Optoma IntelliGO S1 is one of those rare projectors that is completely portable and under one pound that comes with all the necessary inputs, wireless, 3D, and streaming capabilities, as well as a carrying case and an HDMI cable amongst other goodies. For it's price point, you can't beat this projector, however not being in 4K or true 1080p is somewhat of an issue, since the market is going that way right now. That being said, the price is relatively inexpensive for all you get here. It's easy to use, sleek, and quite powerful. If you're looking for an ultra small projector that comes with a ton of perks, this is the one to get if you don't want to break the bank.